1. Heat the oil and fry the onion, peppers and garlic over a low-medium heat, stirring occasionally, for 15 minutes, until soft. Stir in the vinegar; scrape the pan with a wooden spoon to deglaze. Stir in the paprika, reduce the heat and cover. Cook for 15-20 minutes, stirring now and then, until the veg are very soft; season. 2. Preheat the oven to 200°C, gas mark 6. 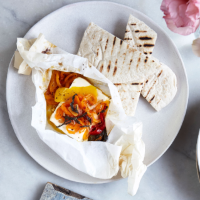 Place each block of feta on a 20cm square piece of foil or baking parchment. Divide the confi t between them and top with a strip of lemon zest and some shredded sage. Wrap up into loose parcels and tightly seal the edges. Bake for 15-20 minutes, until the feta has softened. Carefully unwrap at the table and serve with toasted pitta bread and salad, if liked.